Formed in 2009 at the University of Texas at Austin, “Line Upon Line” percussion has set out to expand their repertoire through the commission of new works. The group’s first disc, released in August 2011, contains four pieces written for the trio by Austin composers. In 2011, the trio was nominated for an Austin Critics’ Table Award for Best Classical Ensemble. October 2011 brought the premiere of their project with architects Emily Little and Norma Yancey, seeing times are not hidden, a site-specific work for three performers and custom chimes. 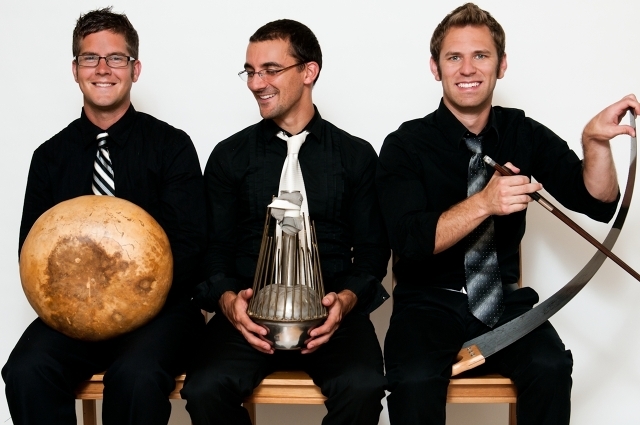 line upon line percussion maintains educational and outreach roles with the Austin Chamber Music Center and has performed at various academic institutions around the country. The group has also performed at the Long Center, the Blanton Museum of Art, Fast Forward Austin and the International Festival-Institute at Round Top. line upon line percussion is Adam Bedell, Cullen Faulk and Matthew Teodori.